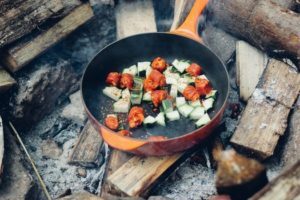 Cast iron is a favorite cookware today, particularly for campers. Cast iron skillets can retain heat very well, and they are naturally nonstick when maintained properly. But many people are confused when it comes to cleaning cast iron skillets. There are many ways of cleaning them and some work better than others. The first method is for lightly soiled skillets. First, you need to pour a bit of oil into the skillet. Take a dish rag and wipe the skillet until it is clean. There should be no food pieces after you wipe off the skillet. Since you have used oil to clean the skillet, you can use it to cook next time around. In fact, the skillet is ready to cook as it is. The next technique is for skillets that have a little more food stuck on them. First, apply a little of an abrasive agent such as sea salt or cornmeal into your skillet. Now scrub the pan with a dish rag. Scrape any food pieces until the entire pan is cleaned. Finish it off by rubbing a little bit of oil. The other cleaning method is for cast iron skillets that are really messy or have food really stuck on them. On the other hand, if you have cooked something smelly such as salmon or fish, you can use this method to clean the pan. You need a steel wool for this purpose. Place the skillet in the sink. Pour some hot water in the pan. Now scrub it with the steel wool. If the food pieces are really stuck, you can soak the pan for some time before scrubbing. You should dry than skillet soon after you wash it. If not, it could rust. You should never use soap when you’re cleaning your cast iron. The porous material of the pan can absorb the soap and ruin the flavor of your food. Once you’ve cleaned up you can re-season your pans with a small amount of oil wiped in a thin coat all around the inside surface. This will keep your pan ready for use and fully operational for many years to come.